- Select Function: Passage, Privacy, Entrance, Classroom, Storeroom, or Dummy. - Lever Option: 17A (All with "A" Rosette). - L Models: Sold Less Cylinder. For matching Cylinders see "Companion Items" below. 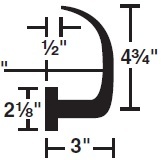 - Delivery: The Schlage Commercial L-Series Levers are factory-ordered, please allow 3-5 working days' lead time. At Schlage we know that every product you specify has to stand up to constant use and abuse. Your building's locking systems face an additional challenge - keeping people and other assets safe while delivering constant, reliable performance. Schlage L Series Extra Heavy Duty Mortise Locks are built to withstand the rigors of daily use without fail. We pay attention to these details so you can focus on creating a functional and aesthetically pleasing environment for your clients. In fact, every one of our L Series locks meets ANSI Grade 1 standards for safety. Function: The Schlage L-Series Levers are available in Passage (L9010), Privacy (L9040), Entry/Office (L9050), Keyed Entry (L9453), Classroom (L9070), Storeroom (L9080), Single Dummy (L0170), and Dummy Pair (L0172) function. Finish: The Schlage L-Series Levers come in Satin Chrome (626) finish. Lever Design: The Schlage L-Series Levers come in 17 Design (A Rose) design. Escutcheon: The L-Series Lever comes in Full Face Escutcheon (L) with 2-1/8" (54mm) diameter Wrought Rose (A). Cylinder Options: All Entry/Office (L9050L), Entrance (L9453L), Classroom (L9070L), and Storeroom (L9080L) functions are sold Less Cylinder; see "Companion Items" above for all Cylinder & Keying options. All Schlage L-Series Locks come standard with Square Corner 2-3/4" Backset Latch and Square Corner Strike (10-072). Case Size: 4-7/16" x 6-1/16" x 1". Armor Front: 1-1/4" x 8". Deadbolt: 1" throw stainless steel. Latchbolt: 3/4" throw stainless steel with anti-friction tongue. Strike: 1-1/4" x 4-7/8", Square Corner, 1-3/16" lip length, Box (10-072). Backset: Standard 2-3/4" Backset (Spring Latch 09-662; Deadlatch 09-663). Certification: ANSI/BHMA Certified A156.13-2012, Series 1000, Grade 1, UL Listed for 3-hour fire door. Special Order Information: For pricing on any function or finish of the Schlage Commerical L-Series Levers not found on this page please contact Taylor Security direct via e-mail (sales@taylorsecurity.com) or call us toll-free at 1-800-676-7670. Latch: 4-7/16" x 6-1/16" x 1". Armor Front: 1-1/4" x 8". - Keyed Entry (Entrance & Office): Unlocked by key from outside when outer lever is locked by push-button in inside lever; Inside lever always unlocked. - Dummy Pair (Dummy Trim): Surface-mounted Dummy Trim for both sides of door. Used for door pull or as matching inactive trim. Special Order Information: For pricing on any function or finish of the Schlage Commercial L-Series Levers not found on this page please contact Taylor Security direct via e-mail (sales@taylorsecurity.com) or call us toll-free at 1-800-676-7670.